The main collection of the Museum of Armoured Vehicles and Equipment consists of weapons from the world wars, but there are also exhibits of post-war technology and equipment manufactured by different countries. After the dissolution of the Soviet Union, the museum became accessible to all visitors, both Russians and foreign. The main collection of the museum consists of weapons from the First and Second World Wars, but there are also exhibits of post-war technology and equipment manufactured by different countries. The museum’s collection includes more than 300 specimens from 14 countries, 60 of which are the only existing examples of their kind. Because its exhibits are so unique, this museum is considered one of the world’s major tank museums. The museum is located in the village Kubinka-1, Moscow Oblast. If traveling by car to the museum, drive on the Minsk Highway before turning to Kubinka (64 km). It is also possible to travel by train from the Belorussky railway station to Kubinka station, and then on Marshrutka no. 59 (a one- way far will cost roughly $7 USD). On the right side of the main entrance under the open sky are several tanks from World War II. These are the MARK III Valentine English infantry tank and the M5AI Stuart American light tank, which were supplied to the USSR through lend-lease. There are also several modifications of T-34 with self-propelled SU-152 guns, which proved themselves during the fight with German Tiger and Panther heavy tanks. Next, walk further to the pavilion of Armoured Vehicles. Among the many exhibits, you can see the latest BTR-90, which is currently used by the Russian Army, as well as a BA- 27M from 1931, based on the Ford-Timken; the PB-4, also based on the Ford-Timken; and an experimental variant of the BA-21 from 1939, based on the Soviet GAZ-21 (1936), which never went into production. The next pavilion is called ‘Light Tanks of the Soviet Army and Equipment of the Airborne Troops.’ Here it is worth paying attention to the first Soviet light tank, MS-1, from 1927. By 1931, over 900 of these tanks had been built. They performed well in battles in the Far East during the late thirties. Next, walk to the Medium Tanks and Major Tanks of the Soviet and Russian Armies pavilion. These tanks include the renowned T-34 from World War II and the T-80, which is part of the state arsenal of the modern Russian army. Here you can also see prototypes of secret military equipment from the Soviet Union. For example, there is an Obyekt 288 experimental rocket tank with gas turbine engines. Also worth visiting is Heavy Tanks of the Soviet Army pavilion. 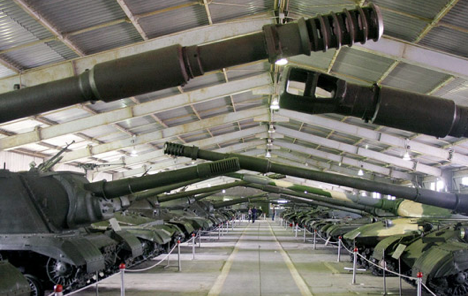 The main attractions of this pavilion are two self-propelled SU- 14 and SU-100-Y guns. These were prototypes from World War II, but they did take part in fighting during the defence of Moscow. Afterwards, they became exhibits at the museum. Because of their size and the difficulty of transporting them, these machines were taken out of service. Two SU-14 guns were released for public display. One survives to this day, while the other was scrapped for metal in the 60s. Only one SU-100-Y was released and it can be seen in the museum today. After a snack at the cafe, go to the Equipment from Europe and Japan pavilion. Near the pavilion stands an armoured vehicle from World War II that participated in the defence of Leningrad (presently St Petersburg). In the pavilion it is possible to see collections of Japanese armoured vehicles from World War II. Other countries are represented primarily by post-World War II specimens. There is even an exhibit from China. A particularly interesting exhibit presents French armoured tank forces. At the entrance stands the very first light tank, FT-17, which was created by Renault in 1917. An interesting feature is its wooden wheels. It is also the most massive light tank manufactured at the start of the 20th century. From just 1917 to 1918, Renault produced 3177 tanks. Following the end of World War I, the tank was manufactured under license agreement in the United States, Italy, the Soviet Union and Finland. The FT-17 was in service in armies of different countries until the beginning of the 1940s. A separate pavilion displays Germany’s armoured vehicles from World War II. This is the largest collection of German military equipment and technology from that time. Here it is possible to view the only specimen of the Mouse super-heavy tank (Porsche-205). The development of Mouse was led by Ferdinand Porsche himself. In total, two prototypes were created. Both Mice were used in fighting against the Soviet army in 1945. During the battle, German commanders decided to blow up both tanks so that they wouldn’t fall into the hands of the Russians. But the Soviet Army still managed to obtain one damaged tank that was seen as a trophy for their troops. It was restored and moved to the museum. The museum is open Tuesday to Friday from 9 am to 6 pm (the ticket window closes at 5 pm). On Saturday and Sunday the museum is open from 10 am until 7 pm (the ticket window closes at 6 pm). An admission ticket costs around $18. The charge for still photography and video shooting is also around $18. The museum’s cash window accepts Visa and MasterCard.